Defensive tackle Ndamukong Suh in January 2015. With one splashy signing, the Miami Dolphins became nominal winners of one of the most anticipated bidding contests in the history of NFL free agency (for a non-quarterback). Their prize: The Detroit Lions’ three-time first-team All-Pro defensive tackle Ndamukong Suh — and $114 million in contract liability. Of that, $60 million is guaranteed, a non-QB record. While big-time free agent signings are exciting, they don’t often end well.1 Players frequently regress to the mean or turn out to be less valuable in new circumstances. But even if Suh turns out to be as good in Miami as he has seemed to be in Detroit — which is far from certain — it’s unclear whether this could ever be a good deal for the Dolphins. With both a hard salary cap and salary floor, an NFL team doesn’t win by paying players exactly what they’re worth — it wins by paying them far less than they’re worth. To help explain why, come back in time with me to a lecture hall on Hillhouse Avenue, where I took Economics 159: Introduction to Game Theory. The teacher — an enthusiastic business school professor — illustrated concepts through a variety of amusing games, and he played for real money. That game was meant to illustrate “the winner’s curse” — a well-known phenomenon by which the winners of certain types of auctions tend to overpay. In particular, the “curse” applies to auctions in which the bidding parties have varying opinions about the value of what they’re bidding on: Whoever overvalues the object is more likely to win — and vice versa. If there ever was a pool of people capable of a wide range of misestimates about commodity value, it’s NFL general managers. While a lot of discussion goes into “team needs” when it comes to potential free agent acquisitions, virtually every high-quality player has a number of teams that need them about equally. That constitutes their market. Of that group, the team that is most irrationally bullish on the player will be the most likely to sign him to a big contract. All of that is present in Miami’s commitment to Suh. The Dolphins weren’t much more “in need” of an All-Pro defensive tackle than most teams, but their bid “far exceeded” that of others. But how expensive is this contract, really? It’s not as simple as its top-line figures — the $114 million for six years. Looking at contracts only in terms of how much and for how long is generally very deceptive. 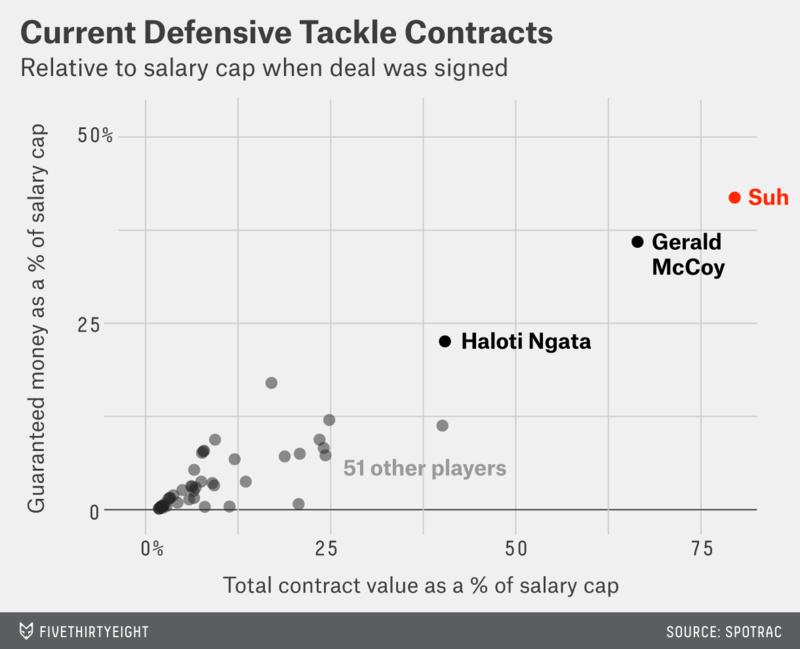 Most NFL contracts aren’t designed to go the distance; they’re designed to work for a couple of years or so and then force everyone back to the table. But one thing a team can’t get around is guaranteed money.4 This is what it’s agreed to pay for that player’s exclusive services — everything on top of the guaranteed money is just indicative of the option to keep paying the player. The average change in wins of these big-splash free agent signings: 1.1 more losses. That’s not how it’s supposed to go. Unless you’re an economist, in which case it’s exactly how you’d expect it to go. The $60 million guaranteed is 42 percent of the announced 2015 salary cap of $143.6 million. There’s a reason that free-agent contracts like this don’t usually happen: Teams don’t want to give big contracts to players they’ve never had in their own locker rooms. This is a perfectly rational response: They have less information about those players (not just about their skills, but how they will fit with teammates, etc.). This uncertainty is like a tax that the player’s previous team doesn’t have to pay. Of course, the goal of signing Suh is to improve the Dolphins’ defense, and it would be pretty surprising if that didn’t happen. But evaluating these kinds of deals can be more complicated than that. The consequences of overpaying can manifest in any number of ways. Perhaps tying up 10 percent to 15 percent of their salary on an interior lineman every year means the Dolphins are unable to pursue a quarterback in future offseasons, etc. And, similarly, a lack of defensive improvement doesn’t necessarily mean that a defensive signing isn’t working: If a team gets a really good player at a good price, it may decide to spend less money on the rest of its defense and spend more on the offense, etc. 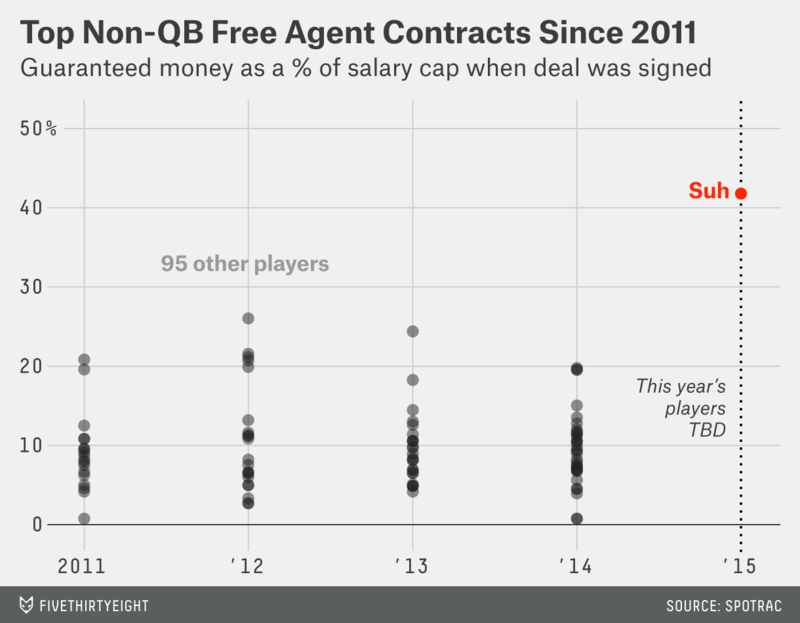 It’s tough to condemn the Dolphins and Suh’s fate based on only a few years of solid contract data (though other historical salary data generally backs up the idea that paying big money to non-QBs isn’t a value play). And granted, these signings sometimes work out under the right circumstances — like when one player drastically affects the balance of power or when the timing coincides with the arrival of a Hall of Fame quarterback. But for every Deion Sanders in Dallas or San Francisco, there’s an Albert Haynesworth, or a Dana Stubblefield, or a Deion Sanders in Washington. The tricky thing about the free agency game that the Dolphins are playing isn’t the worst-case scenario, which is when a team pays a big chunk of its money to a bust. It’s that the best-case scenario is still pretty much paying $20 for a $20 bill. Quarterbacks are an obvious exception — but mostly because the top QBs are almost certainly extremely underpaid relative to their true value. This is how I remember things, anyway. It’s possible the names, structures and actual dollar amounts of these games were different. I only recall him showing mercy once: when we played War of Attrition, a game meant to show how out of hand things can get when both sides have steadily increasing incentives not to lose. It got out of hand. While the timing of its impact on a team’s cap can be shifted around a bit, that’s all just smoothing out the edges: This is the money a team has committed to have that player do whatever he ends up doing for it. 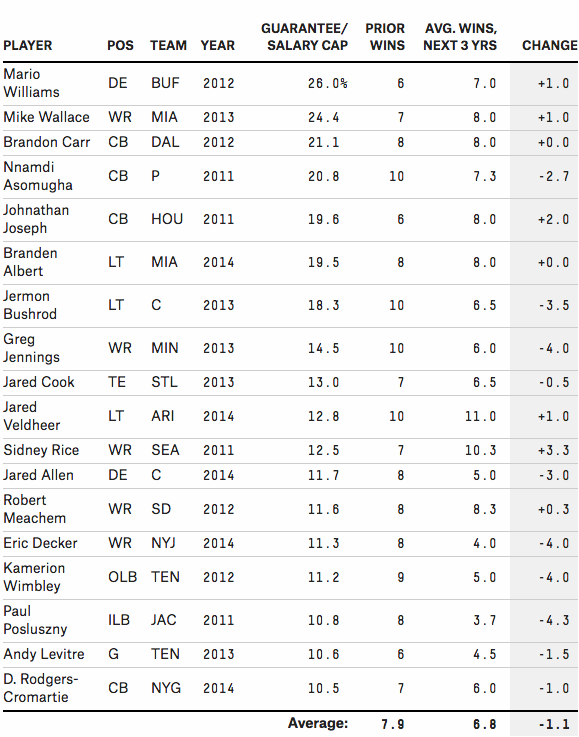 I excluded the teams that had really good or bad records to avoid excessive regression to the mean. Also, if a team had more than one such signing, I listed only the largest acquisition it made that year.